My Dream Canvas: Tea Time With Archana of Rang Decor! Tea Time With Archana of Rang Decor! My "Tea Time Series" continues with today with Archana Srinivas of Rang Decor! Archana as many of you is the author of one of the most popular and innovative blogs out there. She is the first person to feature my home and introduce My Dream Canvas to the blogosphere years ago! Archana is a Tea Goddess :) Her love for tea and tea photography is clearly evident in each of the frames she creates! "The words 'Anytime is Tea Time' describes my philosophy about tea. Tea is my favourite drink. I am almost fanatical when it comes to chai. The sheer experience of enveloping a cup of hot tea in my hands, watching it gently lose steam to the atmosphere, and emanate various aromas, is a joy that has become a daily ritual. The hints of ginger, cardamom, and cinnamon are soothing to my senses— a cup of chai is all I need to begin my day and probably sustain me through the day! I wanted to capture the moments of having tea in the most spontaneous manner possible. I believe that spontaneity is the key to personal projects. So while a daily ritual of a cup of tea may seem monotonous, with spontaneity and creativity you can break the monotony. For me, creative compositions are important as they can bring the mundane to life. Photographs are all around us— patterns, shapes, lines… there are no limits to what one can shoot. This is why I have constantly tried to ‘see’ compositions around me. The subject being just tea gives me the freedom to experiment with various angles. I have never followed any strict rules. But, I am partial to certain kinds of compositions; for instance, top-angle shots are my favorite. There have been occasions when friends have walked into my house, and found me precariously standing on a chair, trying to shoot a top-angle view of chai. While exploring such shots of chai, I realised how different the same subject can look from different perspectives. I also love side shots of the cups where I can capture the steam and the details of colors, reflections and the translucency of the beverage. Being a graphic designer, I am instinctively drawn to unique and creative patterns, frames and compositions in whatever I come across in everyday life—even when I shoot my everyday cups of tea. So whenever there is an occasion for a cup of chai, I ensure that my camera is always nearby. You never know when an interesting composition may come up. While I continue to shoot my daily vignettes of chai everyday, I also upload them online on a blog specially dedicated to tea. 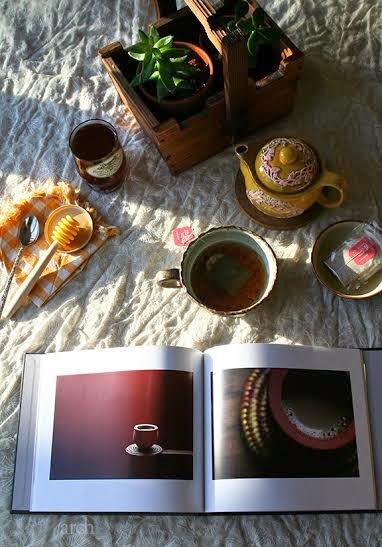 This has resulted in a beautiful confluence of photography and tea, two things that I am so passionate about. 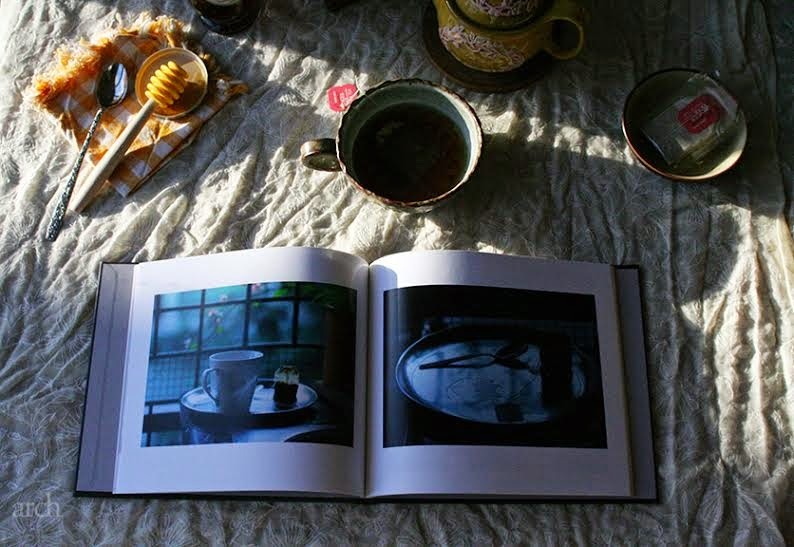 The most natural culmination of a project like this is a book that has the finest collection of photographs that celebrates the eternal cup of tea. 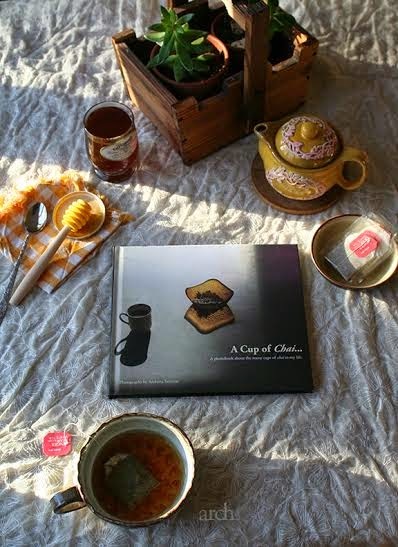 A Tea Table book, very unique in it's concept and a great memoir to gift and pass on to chai-lovers, tea-drinkers and fine art photography admirers." So for all you tea drinkers out there, this book would be just what you need :) Click on the link to purchase the book on blurb. Thanks Archana for sharing your tea time rituals with the readers of My Dream Canvas! Images: Archana Srinivas and subject to copyright.